Sales of legally downloaded songs have shot up more than tenfold in 2004, with 200 million tracks bought online in the US and Europe in 12 months. The global music industry has hailed the increase as a sign the digital music market has "taken off". A million songs are now available to buy on legal sites, according to an International Federation of the Phonographic Industry (IFPI) report. IFPI boss John Kennedy said: "At last the threat has become the opportunity." Legal downloads from the 230 online music stores that now exist generated $330m (£175m) for the music industry in 2004. The IFPI expects that figure to double in 2005. The popularity of mobile music players such as the Apple iPod, were behind this growth said Mr Kennedy. 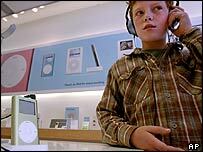 During 2004 about 25 million portable players were sold, 10 million of which were Apple iPods. He predicted that, in 2005, mobile phones that can store lots of tracks would debut and services which stream music to mobiles would become more widespread. Some analysts believe that, by 2010, 25% of record company revenue could come from digital sales - up from 1-2% now. According to IFPI figures only 10% of net users have so far bought and downloaded songs. Efforts by online services to help teenagers get involved by using vouchers and pre-paid cards was boosting take-up, said Mr Kennedy. The figures from the second annual report on the digital music market showed that downloadable tracks were becoming mainstream, he said. Almost half of 16-29 year-olds questioned in December 2004 by the IFPI could name several legal music download services. However, Mr Kennedy, said the music industry still faced a serious threat from sites that let people download pirated pop. "We don't underestimate the challenge that free is still a very attractive concept," he said. "The biggest challenge for the digital music business has always been to make music easier to buy than to steal," Mr Kennedy said. The IFPI estimates that there were 870 million illegal music files available online in January 2005, down from 900 million a year ago. He said that the IFPI had launched 7,000 legal actions against illegal uploaders. Pirates caught by the IFPI have included students, teachers, a nurse, a managing director and computer engineers. Settlement fees of several thousand euros have been paid by those caught by the IFPI. "Legal action is necessary and while it's not always popular we know we have to carry on and we believe that its having an impact," said Mr Kennedy.